Results from Congo's Independent Electoral Commission show presidential incumbent Joseph Kabila has 58 percent of the vote to Jean-Pierre Bemba's 42 percent. Election officials say they will formally present these results to both candidates. The commission is already looking into allegations of fraud in certain voting areas. Before results are official, the Supreme Court has to certify them. 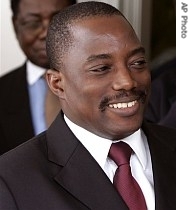 Wednesday, Transitional President Joseph Kabila called for calm. Mr. Kabila, the son of a slain former coup leader, also said the country's army and police were loyal to him. In the case of any escalation in the violence, he said security forces would, in his words, protect the population and their belongings, institutions and the independent electoral commission. Mr. Bemba's supporters maintain that their candidate actually won the election with more than half of the votes, and that the commission's vote count is inaccurate. Commission head Apollinaire Malu Malu responded that these allegations are not supported by fact, and he says he stands by the integrity of the commission's recount process, which he says has been transparent and accurate. Malu Malu has asked both parties to refrain from announcing their own results, which he said do not reflect the real results, and would only be an act of what he called self deception. Release of first round results in August led to deadly clashes between Mr. Kabila's presidential guard and Mr. Bemba's militia. 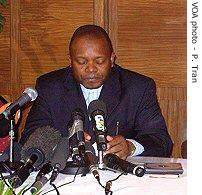 Saturday, there were clashes between police, civilians and Mr. Bemba's militia. Security forces arrested hundreds of people, many of them street children. The U.N. peacekeeping mission called many of these arrests "arbitrary." The international community has paid hundreds of millions of dollars to organize an election process viewed as key to ending decades of misrule and conflict in the large mineral-rich Congo.